Here are some excerpts from the article in Culture section of the korean herald by Song Woong-ki. Please click HERE if you'd like to read the full article. 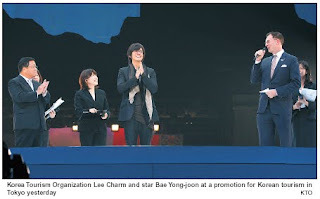 Hallyu star Bae Yong-joon joined Korea Tourism Organization president Lee Charm in declaring "2010-2012 Visit Korea Year" at Tokyo Dome yesterday in a rare overseas promotion for the Korean tourism industry. The event, organized by Visit Korea Committee, drew an estimated 45,000 Japanese, many of whom had come to get a glimpse of Bae or "Yonsama," as he is popularly known in Japan. The promotion also got a boost from the participation of Miyuki Hatoyama, wife of Japanese Prime Minister Yukio Hatoyama. Lee, who also serves as Vice Chair of the Visit Korea Committee, and the 37-year-old "Winter Sonata" actor opened the event by carrying out dialogue with each other in a talk show format about the tour packages and benefits available for Japanese visitors to Korea. Lee [ myoce : I think this is an error, should be Bae !! ] recently penned "Traveling In Search of Korea's Beauty," released last week. The book is selling so well in Japan that the publisher is having difficulty meeting orders.